Winter weather is inevitable in Minnesota. People with disabilities need to take extra steps to be prepared. Be ready and keep safe and warm when the snow flies. Follow weather forecasts and have those winter weather information resources at hand in advance. It’s easier to do than ever, with numerous apps and alerts that can be downloaded or subscribed to with smart technology. Television and radio stations, and the National Weather Service office provide constant weather updates. 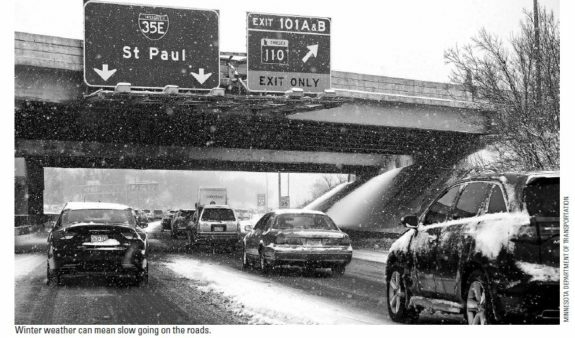 Cities and some counties, along with Minnesota Department of Transportation, provide ample information services, on road conditions, and snow emergencies and streets plowing times. Many cities now have email, Twitter and Facebook notices of snow emergencies. A National Oceanic and Atmospheric Administration (NOAA) weather radio receiver is a great weather information option year-round. So is a battery-powered or hand-cranked radio for weather alerts, in case of a power outage. Mind the forecasts, and have adequate clothing and emergency supplies for home and motor vehicles. weather, let a family member or friend know about a trip, and expected arrival time. Check in and use the buddy system. Being stranded in a motor vehicle can be dangerous. Vehicles cannot be counted on for warmth. Move to the side of the road and wait for help inside the vehicle. Use flashers. Raise the hood if it isn’t snowing, raining or windy. Only run the vehicle motor and heater for about 10 minutes per hour. Open a window slightly for fresh air and make sure the exhaust pipe is clear of snow. This will reduce the risk of carbon monoxide poisoning. A tow chain or rope is important, as are jumper or booster cables. Other needs are some roadside flares and reflectors, a distress flag and a whistle. A distress flag can something as simple as a homemade “Help” sign or a red cloth or scarf to hang on an antenna. A whistle is another good way to get attention if a vehicle is stranded. Remember to pack a flashlight with extra batteries, cell phone charger with an adapter for the vehicle, battery-powered radio, water and food. Good foodoptions are energy bars, raisins, candy bars and things that can be eaten without preparation. Include food and water if an assistance animal travels along regularly. Include matches, a metal can and small candles in the kit. That can be used to melt snow for drinking water. Don’t eat snow because that lowers body temperature. Extra hats, socks and mittens are also important, as is a sleeping bag or heavy blanket for each person who regularly travels in the vehicle. Don’t fall asleep. Keep moving as much as able to stay warm and awake. Every vehicle should have first aid kit with pocket knife. And keep a supply of medications in a purse or bag that is carried every day. Store items in the main vehicle as the trunk can freeze shut. It’s important have a small lock de-icer but even those can be ineffective if a lock is frozen solid. Report unshoveled sidewalks and bus stops, and streets and roads that haven’t been plowed. Some communities have information and complaint hot-lines. Transit services also may have complaint lines if a transit stop isn’t cleared. Anyone with a disability that is aggravated by weather should keep outside trips brief, to avoid triggering any condition. Wear a hat, scarf or mask to cover the face and mouth, sleeves that are snug at the wrist, layers of loose-fitting, warm clothing and a water-resistant outer coat to stay dry and footwear. Make sure the outermost clothing layer is tightly woven to reduce the loss of body heat. Stay dry because wet clothing can cause chills. Avoid getting alcohol or gasoline on skin during cold weather because those liquids can cause greater heat loss from the body. Starting to shiver is a sign that it’s time to go inside and warm up. Walking on ice and snow can be dangerous. A fall can cause serious and even fatal injuries. To stay safe at home, stock up on salt, sand, clay cat litter or chemical de-icers for increased stability on sidewalks. Slip-on cleats that can be put on the bottoms of boots and shoes are a lifesaver. Very limited home snow shoveling help is available for people with disabilities and senior citizens. Faith-based institutions, neighborhood groups and neighborhood nurse/senior programs are possible options. Call the Senior Linkage Line 1-800-333-2433 or Disability Hub MN at 1-866-333-2466. Many Minnesotans, especially those in rural areas, face the risk of losing power during a storm. Prepare for longer waits in rural areas. Make a winter checklist and be ready for a week without access to food, water and electricity. Have drinking water, canned food and a manual can opener. Stock up on foods such as breads, crackers and dried fruits that can be eaten without cooking. Have a stock of prescription and non-protection drugs and a first aid kit. Make sure flashlights and battery-powered lanterns are working, and extra batteries are on hand. To reduce the risk of accidental fires, don’t use candles. Service animals’ needs also should be considered, by stockpiling needed pet food and water. Be careful with space heaters, wood stoves and fireplaces as those can cause burns, start fires or in some cases add to the risk of carbon monoxide poisoning. Make sure home carbon monoxide and smoke alarms are in good working order. Close off rooms that aren’t in use to conserve heat. Close drapes or cover windows with blankets at night. Stuff towels or rugs beneath cracks under doors. Extreme cold can cause home water pipes to freeze and sometimes rupture. When very cold temperatures are expected, leave all water taps slightly open so they drip continuously. Keep the indoor temperature suitably warm. Improve the circulation of heated air near pipes. The article on winter’s challenges for people with disabilities was good and informative. But there is seldom mention of the prevalence of wood smoke as a challenge–in all seasons–for people with breathing disabilities in particular, and for children of all ages. Exposure to the increasing smoke from wood burning restaurants and fireplaces is a true physical barrier that should be addressed, though it is politically unpopular to do so. I have a Disability sticker for my car, so that I can park closer to buildings I’m trying to access without having to breathe undue exhaust by crossing streets or breathing the smoky air. Let’s all speak up for cleaner air, to remove or reduce THAT barrier!